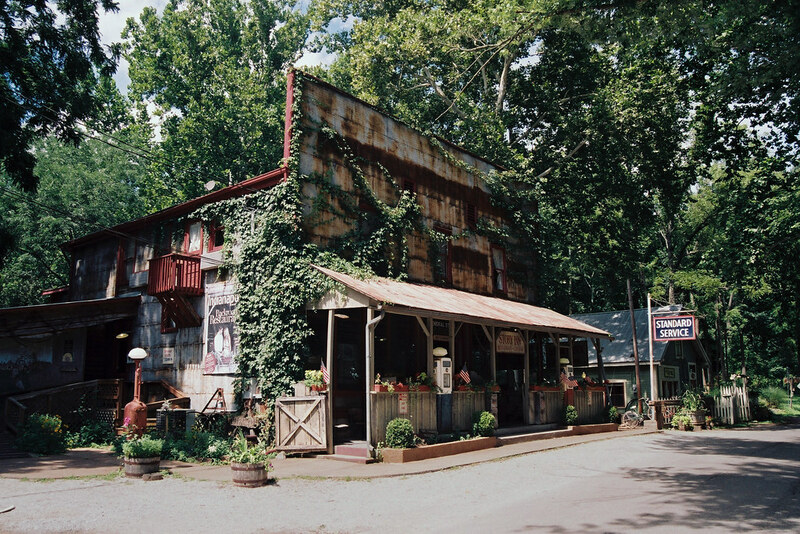 You’ll find this old country General Store, today operating as an inn and restaurant, in the middle of nowhere in Brown County, Indiana. This dot on the map was an important little village until the Great Depression did it in. But I’m getting ahead of myself — come back tomorrow to read the story of Story, which is what this village is called. I made this photograph on my first visit to Story a few years ago. 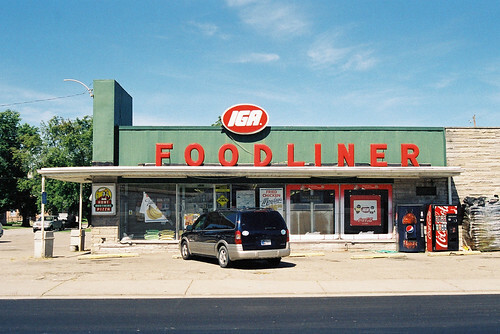 I remember a time, during my 1970s kidhood, when the IGA Foodliner was the official grocery store of the rural Midwest. 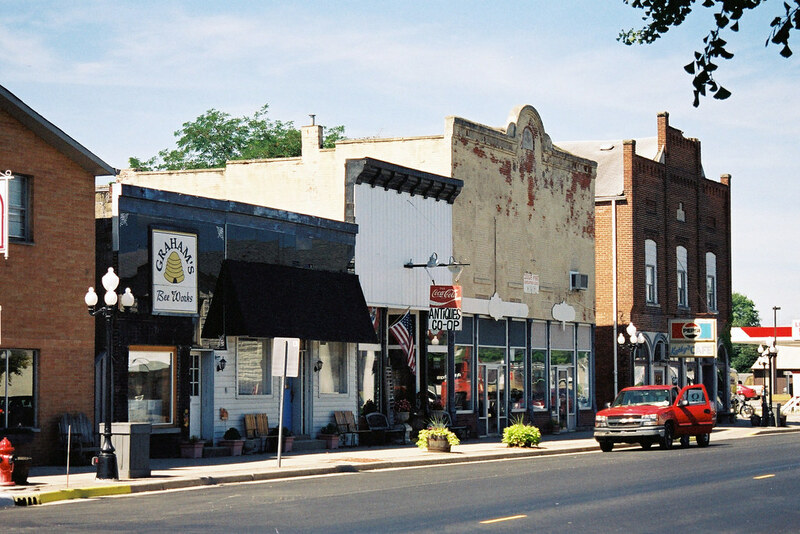 Even through the 1980s, if you drove out of the city and into the cornfields, when you came upon a small town you’d almost certainly find a Foodliner. In the intervening years many rural IGA stores have closed. The one in Burlington, Indiana, on the Michigan Road, was the only one left anywhere near me as far as I knew. It hung in there until a couple years ago, but it’s a Dollar General now. When I came upon this one as I passed through Morgantown, Indiana, recently, I stopped to photograph it. It’s hard telling when I’ll see another, and this is such a classic example. Nikon N60, AF Nikkor 28-80mm, expired Kodak Gold 200. When a buddy of mine said I could have his Nikon N60 for $20 (and if I met him for lunch and paid), I said yes. It wasn’t because I’ve always dreamed of owning an N60 – I’m more into old-style, all-metal, all-manual film SLRs, and the N60 is a modern, plastic, auto-everything SLR. No, it’s because I can’t resist a stray camera. Heck, I even have a camera very much like this one already – the Nikon N65, which was the N60’s successor. The N60 was made from 1998 to 2001, and the N65 picked up from there. I’m going to skip my usual rundown of this camera’s features because, really, just go read my writeup of the N65. The N60 is slightly less camera than the N65, with less sophisticated autoexposure and autofocus systems, no depth-of field preview, and no way to fire the shutter remotely. But who cares? This camera is tricked out just fine for the easy automatic shooting it’s meant for. Set the dial atop the camera to Auto and the N60 is a giant point-and-shoot that makes you feel like you’re a real photographer. If you like auto-everything SLRs, also check out my reviews of the Nikon N65 (here), the Nikon N90s (here), Canon EOS 630 (here), the Canon EOS A2e (here), and the Minolta Maxxum 9xi (here). If you’re a Nikon fan see my reviews of the F2 (here), F3 (here), and FA (here). Or just check out all of my camera reviews here. My N60 came with a couple of Quantaray lenses, one at 28-80mm and another at 100-300mm. I took only a few photos with the Quantaray lenses, not expecting much from them. I also loaded a roll of expired Kodak Gold 200 I found at the bottom of the bag the camera came in. I did have to get the two 123 batteries out of my N65 to power the N60; without them, the camera is inert. As so often happens, I started shooting in my front yard. 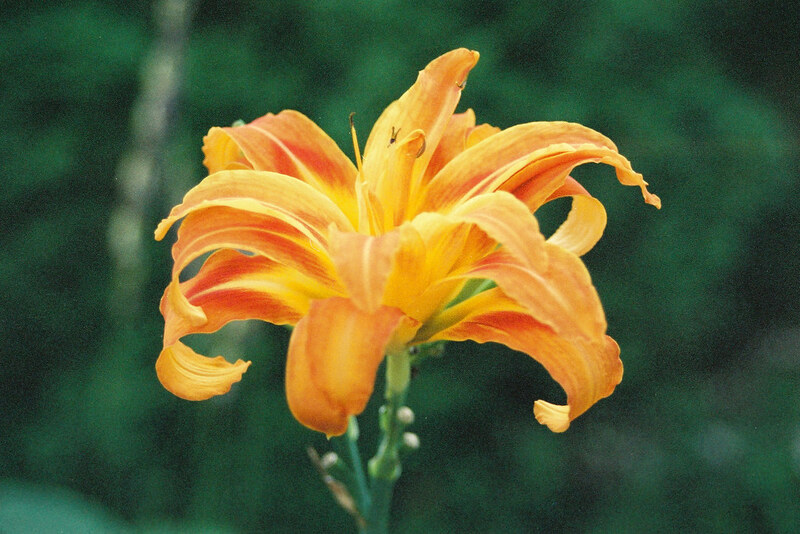 My tiger lilies were in bloom. 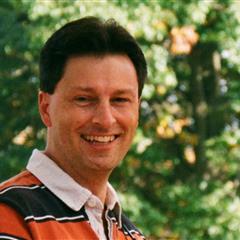 The photos from the Quantaray lenses show a fair amount of noise and some barrel distortion. This is the best shot from the Quantaray lenses. The black areas were pretty noisy, but I fixed that in Photoshop. I used the AF Nikkor 28-80mm f/3.3-5.6 off my N65 for the rest of my photos with the N60. Noise disappeared and sharpness and color rendition improved. 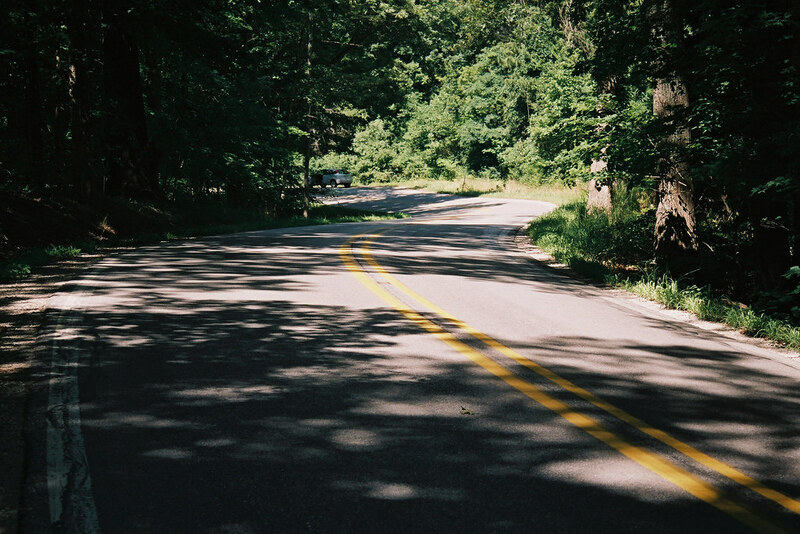 You’d never guess this shot of the main drag in Morgantown, IN, was shot on expired film. 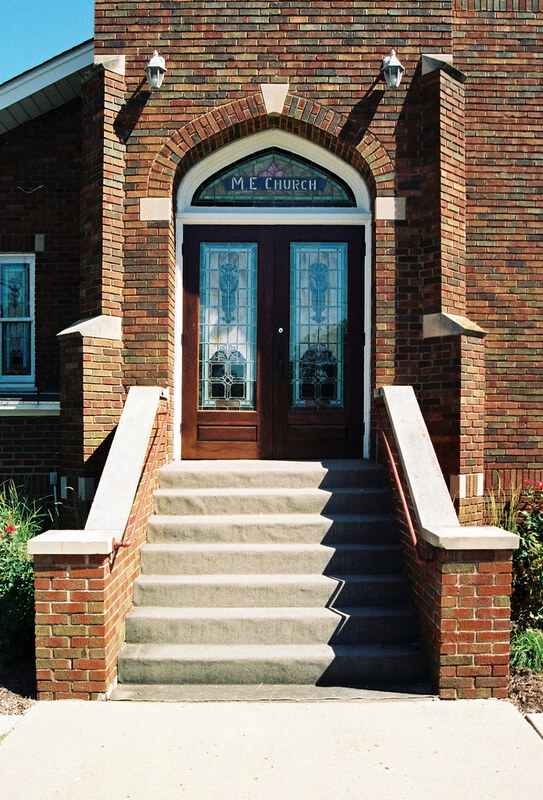 This is the entrance to the Methodist church in Morgantown. 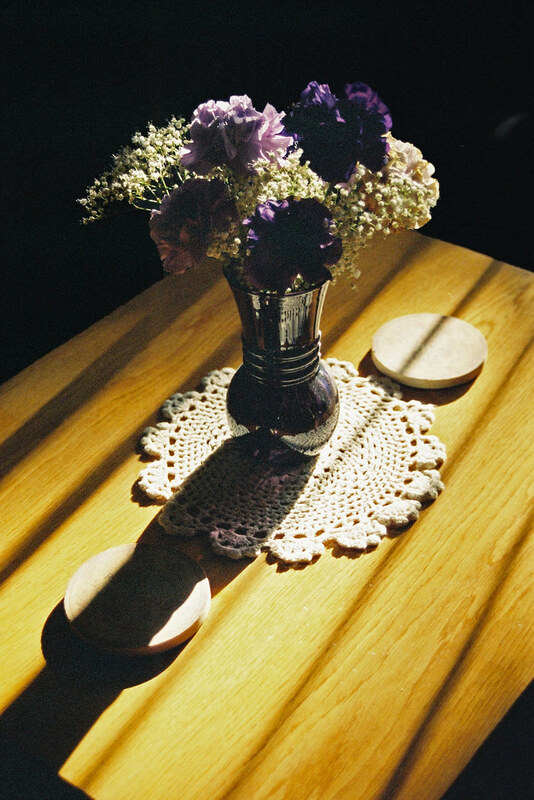 When I finished the expired film, I dropped in some fresh Fujicolor 200 and kept shooting. This is the Story Inn, a little restaurant and bed-and-breakfast in Brown County, just off State Road 135. 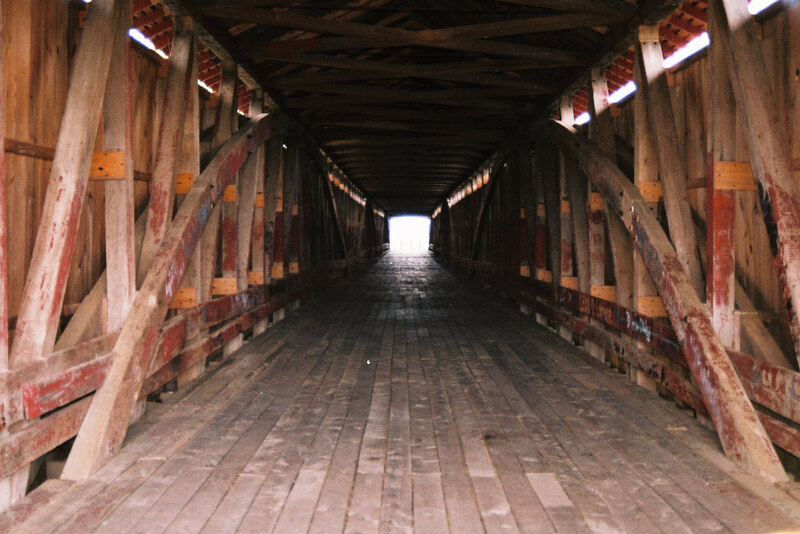 Here’s the inside of the renovated Medora Covered Bridge. The N60 handled this challenging lighting situation pretty well. On the other hand, the N60 struggled with the blazing sunlight contrasting with deep shadows from overhanging trees on State Road 45. It favored the shadows; lit areas were a little blown out. 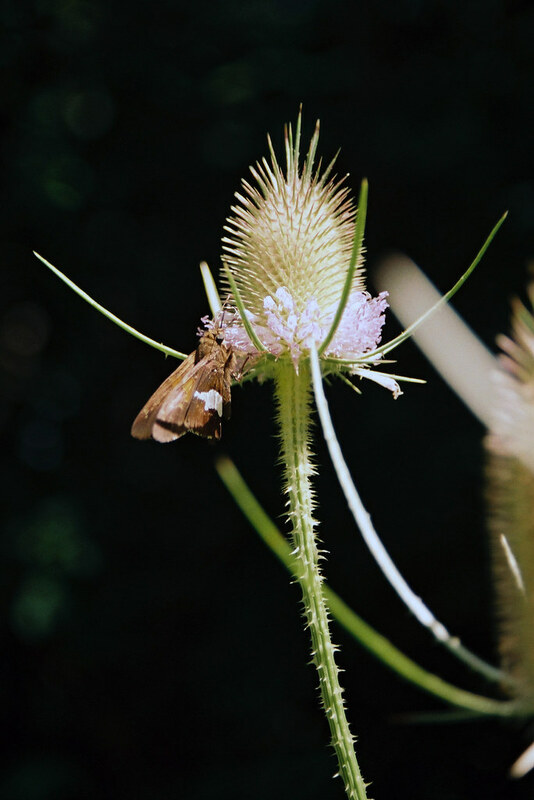 This spent thistle bloom stood along the roadside there. 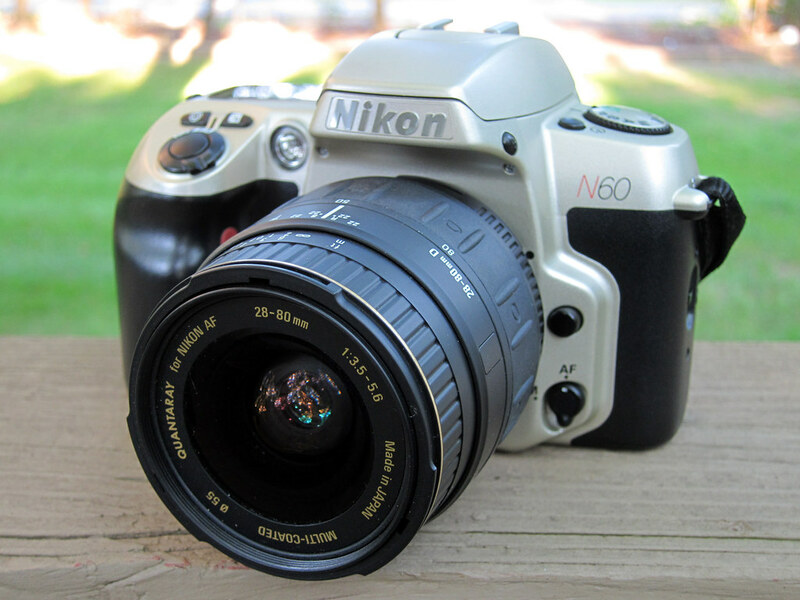 If you’d like to see more photos from this camera, check out my Nikon N60 gallery. I wasn’t very enthusiastic about my N65 when I shot it last year, but I rather enjoyed shooting this N60. When I shot the N65, I farted around with it in old familiar places. But I took this N60 along on a road trip as my primary camera. As such, I used it as a tool, and it handled easily. Except for the challenging light on State Road 45, it performed well, especially after I ditched the Quantaray lens for a Nikon lens. My recent State Road 45 excursion started in the little town of Beanblossom (or Bean Blossom, if you prefer). If you like bluegrass music, you probably recognize it as the home of the Bill Monroe Music Park. There’s not much more to Beanblossom. 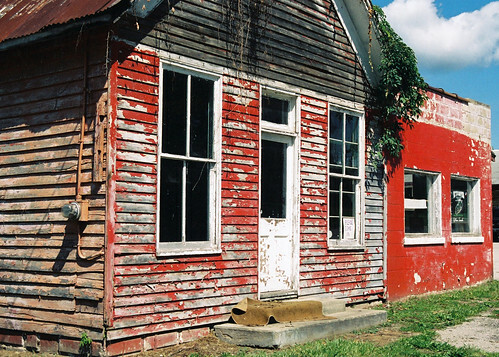 But this great little red building stands on the northwest corner of Beanblossom’s main drag, State Road 135, where it intersects with State Road 45. I recently added a Nikon N60 to my camera collection and it was along for the ride. As a modern auto-everything film SLR, it’s not the kind of thing I normally buy. But I couldn’t resist the good deal I was offered, and it made for easy shooting on this this perfectly sunny day. A couple rolls of expired Kodak Gold 200 film came with the camera, so I plopped one in and off I went. Rather than shooting the probably lousy Quantaray zoom lens that came with the camera, I attached the AF Nikkor 28-80mm lens from my similar Nikon N65. 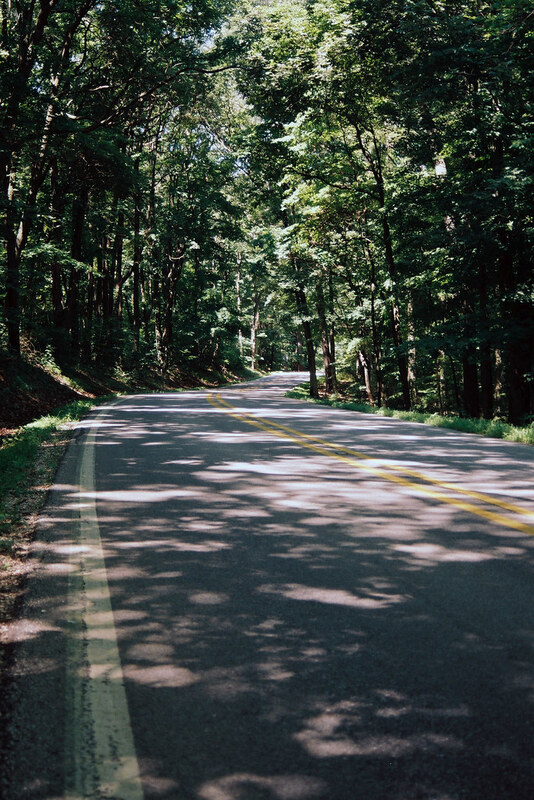 One of my favorite drives in Indiana is State Road 45 between Beanblossom and Bloomington. 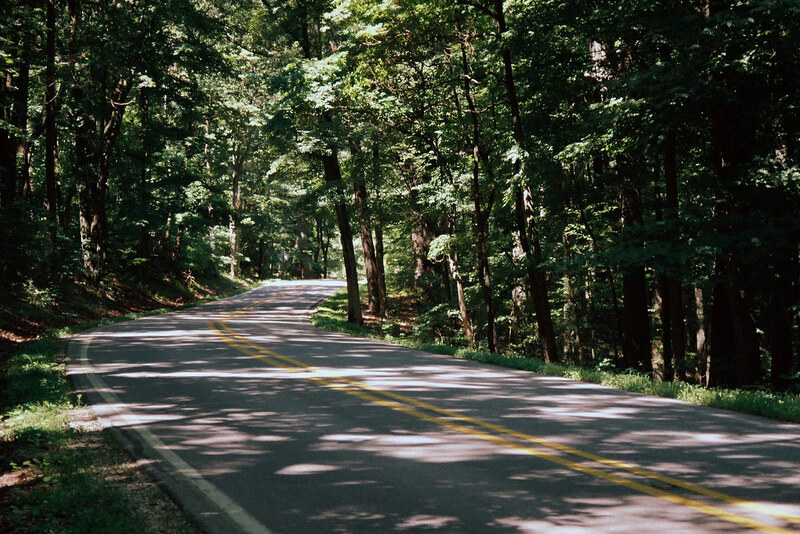 It’s a twisty little marvel that cuts through the Yellowwood State Forest. Imagery © 2013 Google. Map data © 2013 Google. I first drove it in 2006 (story here), just after my inner roadgeek awakened. I hadn’t been back since. It was time to correct this grievous error. 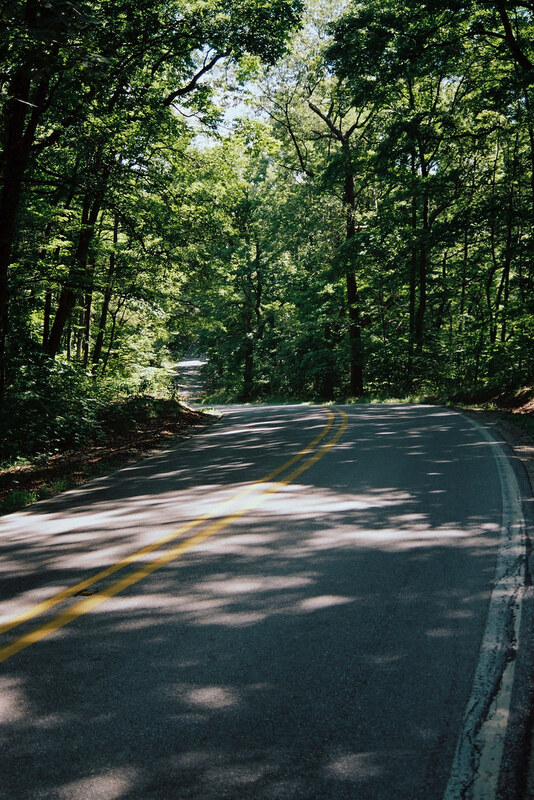 Near a dot on the map called Needmore there’s a place to pull off the road. All of these photos are from near there. 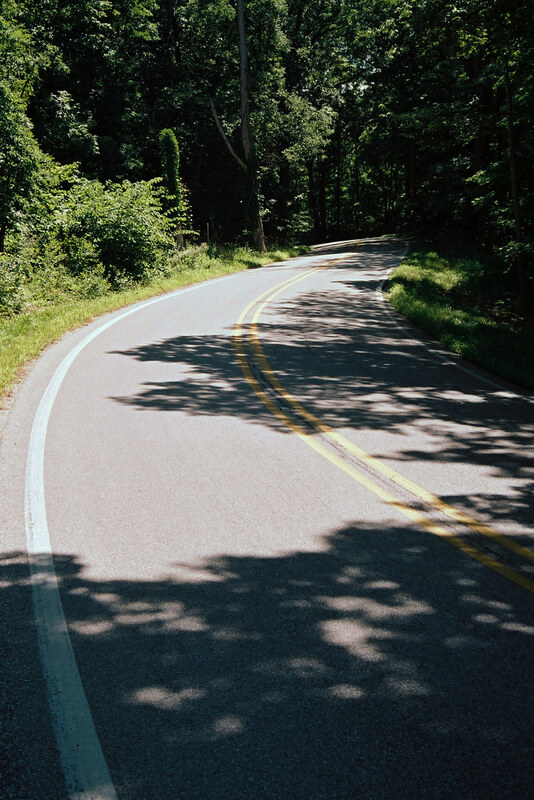 I first drove this road after finding a posting on a motorcycle forum that claimed that State Road 45 would “make a man out of you.” That was good enough for me. 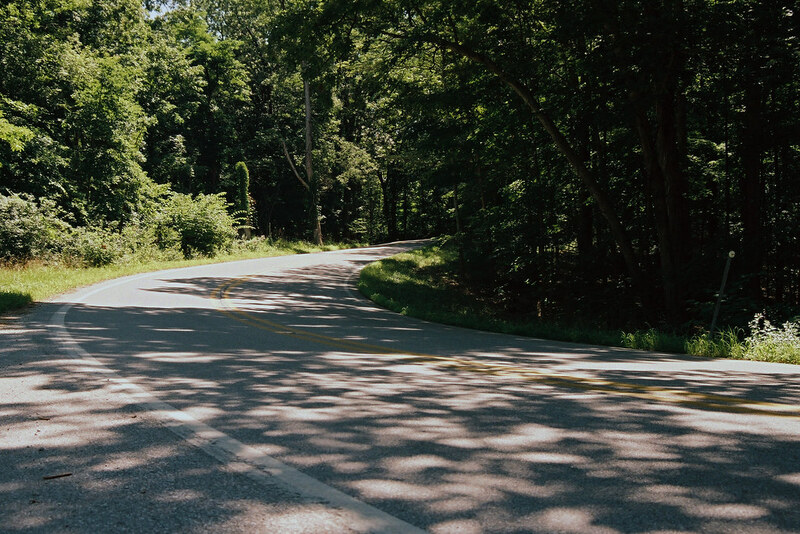 When you stand on a highway taking pictures, your eyes and ears must be wide open – other drivers won’t expect to come upon you. But I had this great road all to myself the whole time I stood in it with my camera. Even though these photos are all from the same short stretch, they are representative. This is a heavily wooded, curvy drive. My little Ford Focus is a surprisingly good handler and made driving these curves a blast. If you squint, you can spot it parked in this photo. I took all of these photos with a Nikon N60 using an AF Nikkor 28-80mm lens on Fujicolor 200. This camera is a recent addition to my collection, and I’ll write about it at length soon. southwestern Indiana. Read about it.